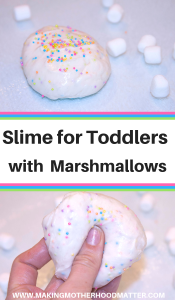 Inside: Want to make slime for toddlers with marshmallows without having to worry if your toddler takes a nibble when you’re not looking? 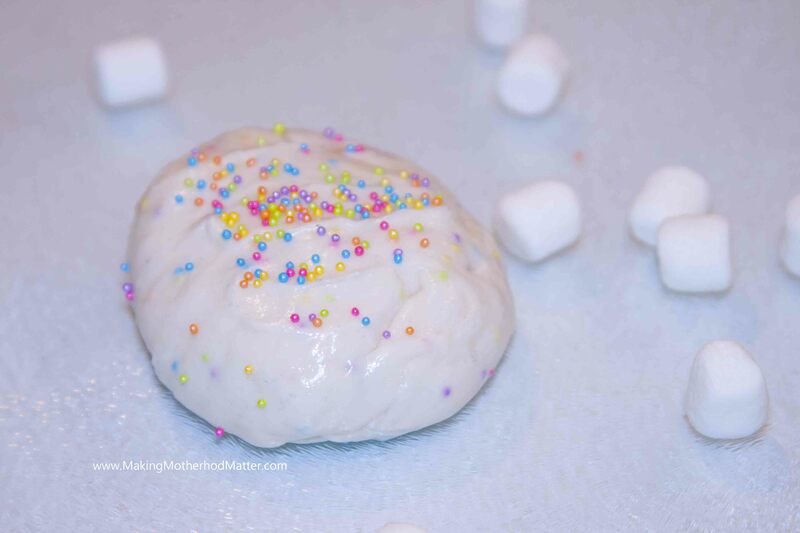 Use this edible birthday cake slime recipe plus we share our favorite spot to find 40 ways to make slime. The book The Slime Book was gifted to me, however, all opinions are my own. This post contains affiliate links. I barely closed the front door before my kids were pawing at the brown package in my hands. “What’d ya get mom?” my daughter asked. I sat on the floor and peeled the cardboard back to reveal the rainbow-colored book. “Slime!” she squealed. I set my daughter up on the couch with a blanket and a few sticky notes so she could browse through The Slime Book and pick out her favorite recipe. “Can we make it today? Please mom!” she begged. I convinced her we could wait just a few days so that I had time to order a few of the items we needed. For the next three days, she hugged her new prized book and scrolled through over 40 slime recipes. She finally settled on the edible birthday cake slime, although the rainbow slime recipe was a close second. Because well, it was edible, and it was made from marshmallows. We covered the counter with plastic wrap (for easy clean up), pulled up some chairs, and I tied a smock around each of my toddlers’ wiggly bodies. We love exploring slime, like when we played these slime number games, so I’ve learned a few tricks to make clean up easier. First, we melted the marshmallows in the microwave until they melted, which took about 40 seconds for us. Then, we stirred in some of the coconut oil and vanilla. Next, my kids took turns sprinkling the powdered sugar into the bowl while the other child mixed. 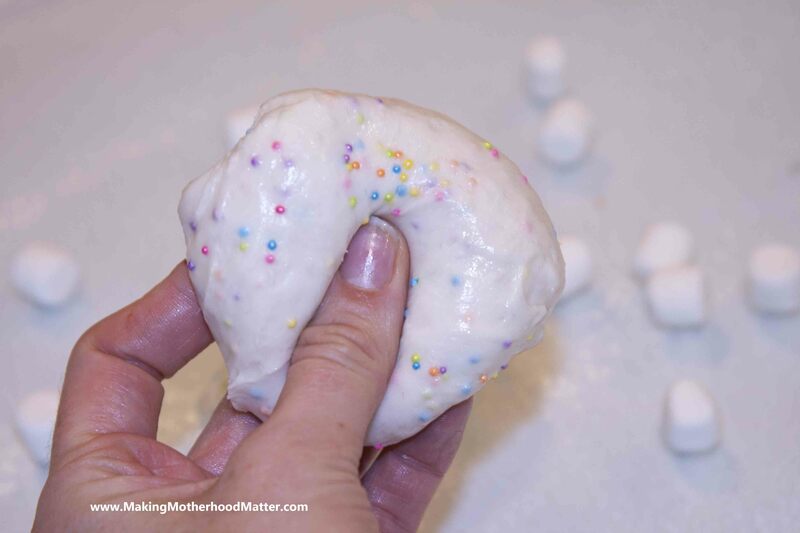 My toddler’s favorite part was when we all smeared our hands with coconut oil and finished kneading the slime. Every time our hands started to feel a little sticky, we would just reapply some coconut oil. Finally, we added sprinkles and played with the slime for toddlers. 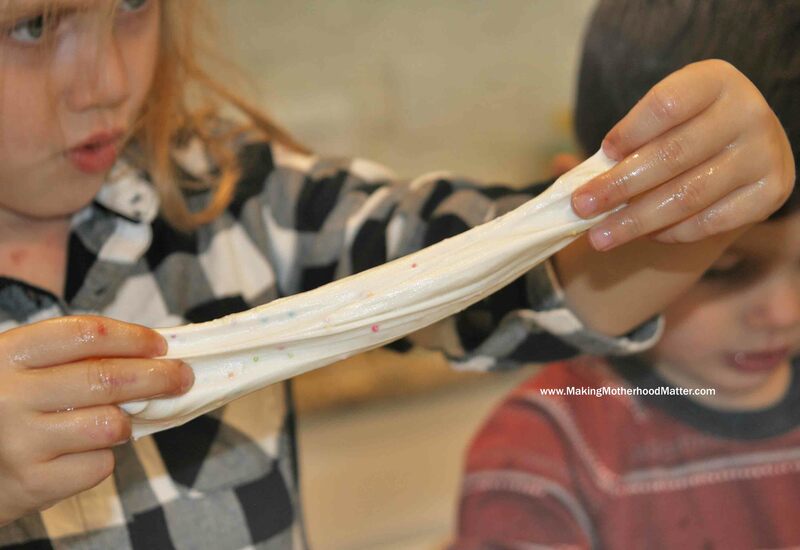 My kids had so much fun stretching, squishing, smelling, and of course tasting this edible slime. The best part for me is that I didn’t have to worry about it since it was an edible slime and toddlers often put objects in their mouths, especially when they are exploring something new. When we were all done, the coconut oil came off pretty quickly with a little warm water and dish soap. And thanks to the smocks and plastic wrap it was a super quick clean up for me so I could jump into playing the next activity from this list of over 100 rainy day activities for toddlers. I discovered a few tips for making playing with slime fun and easy. When we make this recipe again, I think I will try coating the bowl with coconut oil before we melt the marshmallows. I always use art smocks to protect my kid’s clothes, because some versions of slime can be quite tricky to get out. Plastic wrap is my BFF. For real though, it saves me a lot of time for clean up especially when we are playing with slime and coconut oil combined. We were lucky that we didn’t have any slime in the hair incidents this time, however, we haven’t always been as fortunate. After lots of practice, (ha!) I’ve learned that the best way to get slime out of hair is to start at the root with dish soap (like loads of it) and slowly pull out toward the end. Really, I don’t see this recipe being one to get in the hair as it’s not drippy, but I’ve had it happen with glue-based slime recipes. Here’s another list of over 10 other helpful tips and tricks for making slime. Use this list as a beginners guide to making slime, including videos and how to avoid slime fails. We had a ton of fun making this edible birthday cake slime. For over 40 more fun slime recipes for kids including classic slimes, holiday slimes, more edible slimes, and unique slimes be sure to check out The Slime Book. My daughter genuinely loves this book. So much so, that we might buy a few as presents for her friends this year. If you try this slime out or have any feedback, feel free to let me know in the comments below. 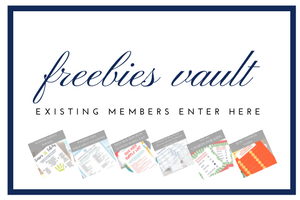 PS – If you enjoyed this piece, you might also like Over 100 Easy Kids Activities That are Surprisingly Fun. Spending time with your kids can be surprisingly fun with these easy kids activities. This is a growing list of ways to spend quality time together.